How will the changing climate affect the way we grow fruit now and in the years to come? Greg Peck, Assistant Professor in the Horticulture Section, sat down with Susan Poizner, host of the Orchard People podcast for a wide-ranging discussion about sustainable fruit productions systems, how climate change will affect fruit trees and what growers and gardeners can do to prepare. 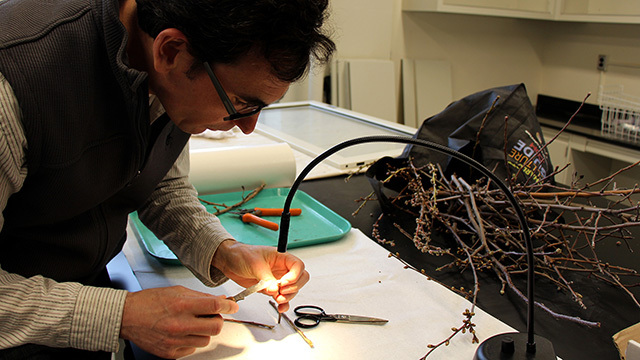 Greg Peck dissects fruit buds in his lab to assess frost damage.